East Wansdyke at Brown's Barn (click here to enlarge), looking east to Bishop's Canning Down. In the middle distance you can see the Romano-British enclosure. Another air shot of East Wansdyke at Brown's Barn (click here to enlarge), looking east to Bishop's Canning Down. East Wansdyke at Tan Hill (click here to enlarge), looking west to Morgan's Hill. Left is Roundway Down, where the famous 1643 battle was fought. 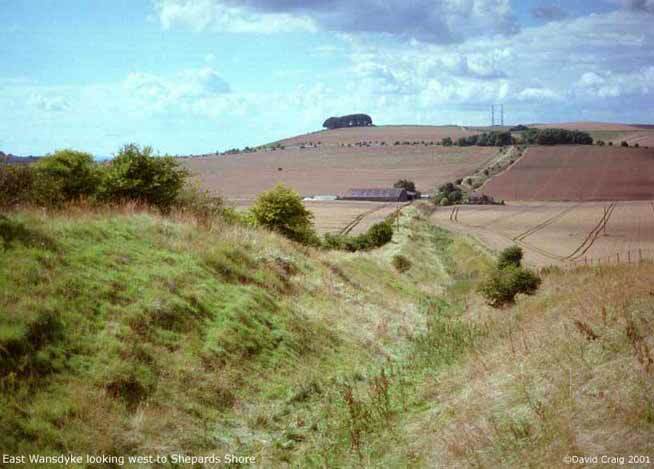 Wansdyke now runs down to the modern Devizes road in a very straight line, which it crosses at Shepherds Shore. This is possibly the best-known section of Wansdyke, for everybody passing along this much-frequented road is bound to observe the very obvious course of the earthwork to the west and east of the road. Though parking is troublesome here, the very beautiful pictures displayed of this section were made by two American visitors who dared to. 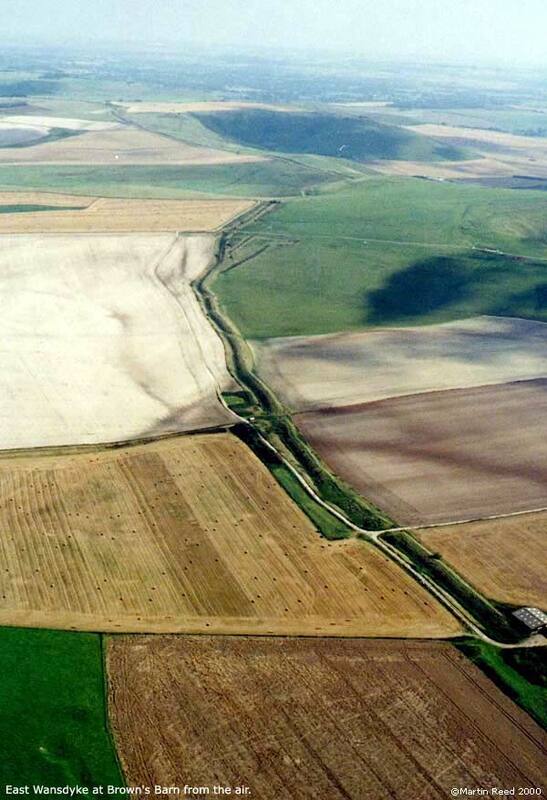 East of the road, the ditch is filled in, but it soon regains the depth that is so typical for East Wansdyke. 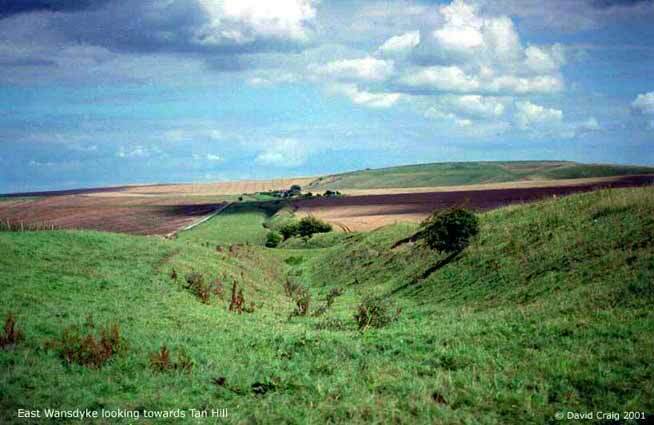 Wansdyke now climbs out of the dry valley. As it climbs the shoulder of Bishop's Canning Down, again on the reverse slope (the hill-crest being 300ft to the north! 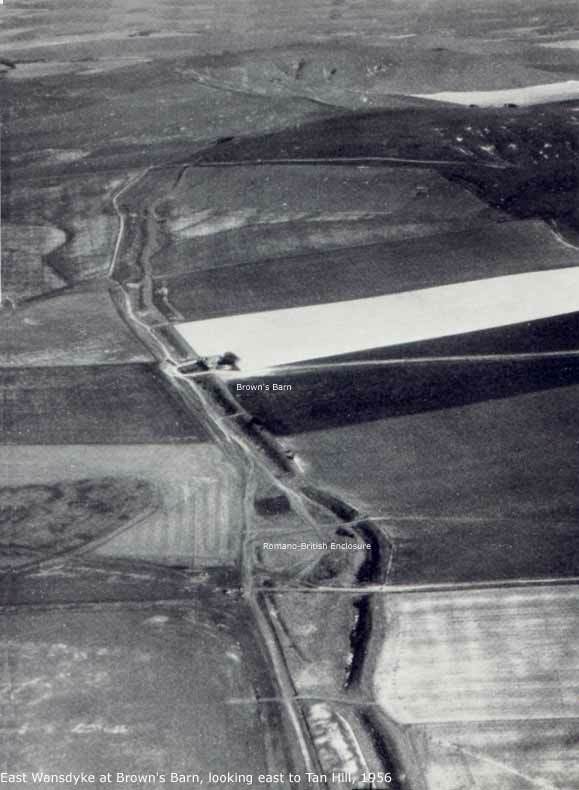 ), Wansdyke is strengthened by an immense counterscarp, with a second ditch in front, a unique feature for Wansdyke, albeit a very short one. 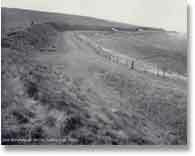 As seen in the picture right (click here to enlarge), as well as the 1956 one left, which shows cleary by the dwarfed figures on what scale Wansdyke once was built. 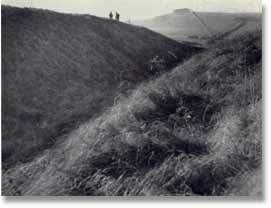 The very deep ditch can clearly be seen on the two images below, and it takes no difficulty imagining an army attempting to cross Wansdyke at this point - and failing miserably! 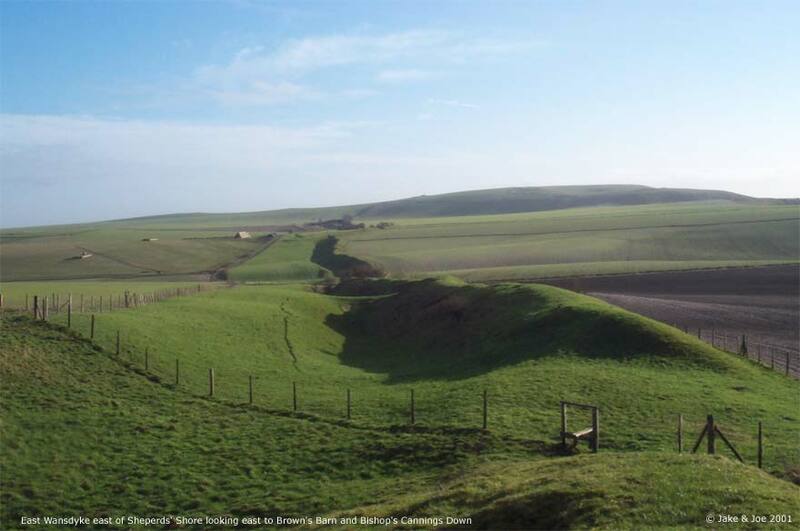 Wansdyke runs on in a straight line across Bishop's Canning Down, but a small bend occurs just before Browns Barn, where Wansdyke uses one side of a Romano-British enclosure. 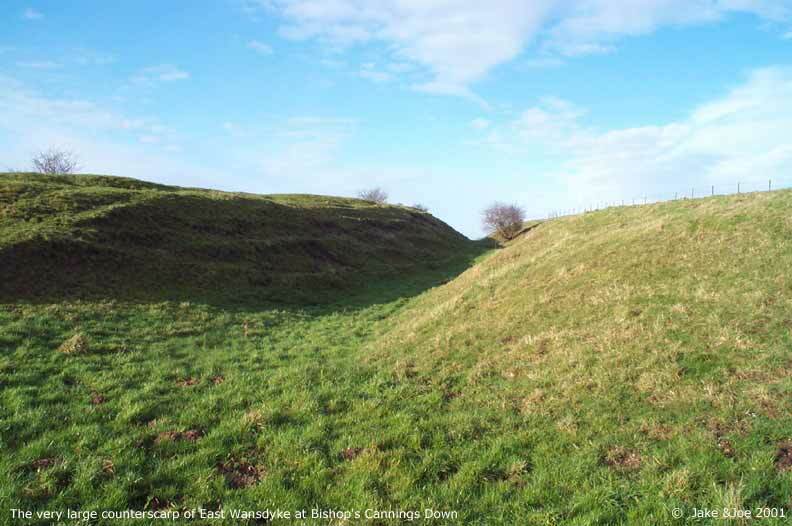 Just beyond that, Pitt-Rivers dug a second section (1890) after the one encountered above, and he found again evidence of 1st, 2nd and 3rd century date, which proved once more that Wansdyke was to be dated to Late or Sub-Roman times. 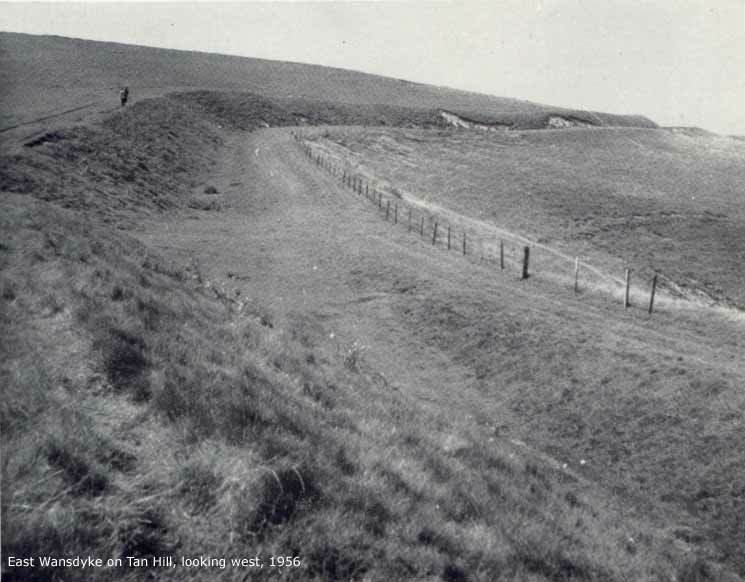 The course of the earthwork takes us straight east towards the foot of Tan Hill, where the dyke curves sharply to the south in the ascent of the hill. 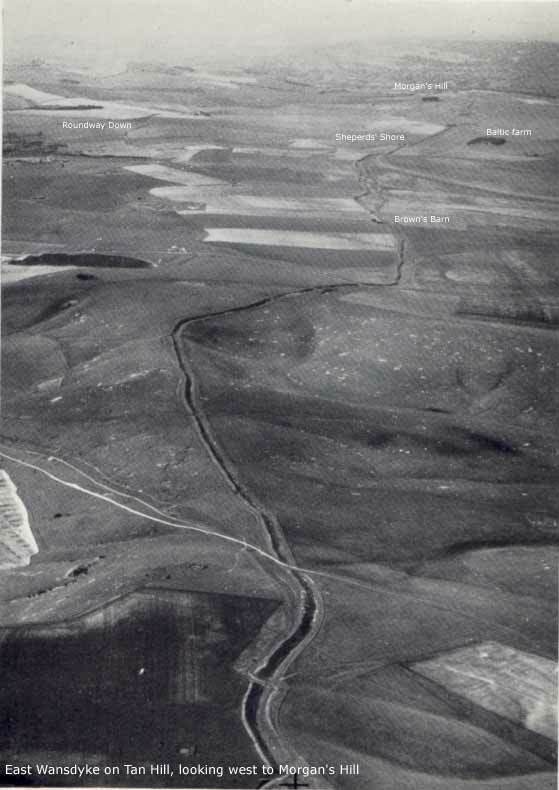 Here, Wansdyke commands a better defensive position than ever before; its field of view is excellent, covering the whole of the Kennet valley and beyond, and any movement could have been detected from as far away as 5 miles on a good day. 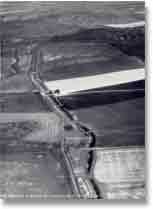 Maybe as a consequense, there is hardly any counterscarp, as can be seen on this 1956 picture (click here to enlarge). Wansdyke skirts the steeps heads of the combes that flow away to the north, and which must prevent lateral movement, canalising any line of assault. From Tan Hill, practically the whole line of Wansdyke is visible. Westwards to Morgans Hill, and eastwards towards the low ground beyond Milk Hill, up to the wooded reaches of Savernake Forest, where Wansdyke is now thought to end. 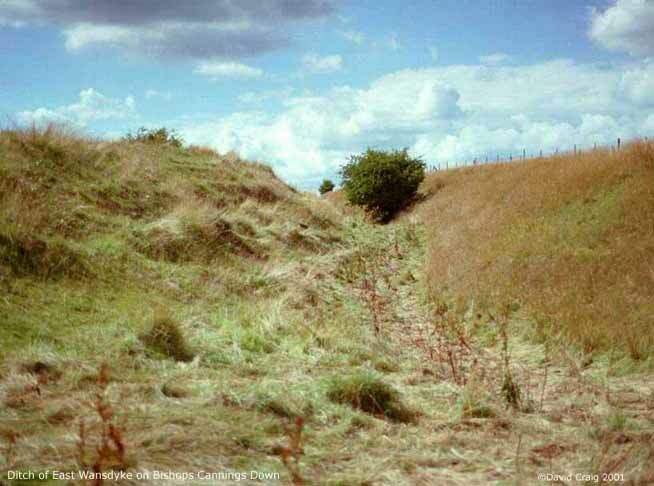 It is not a strange thought to suppose that East Wansdyke may have been planned from this point by the builders. 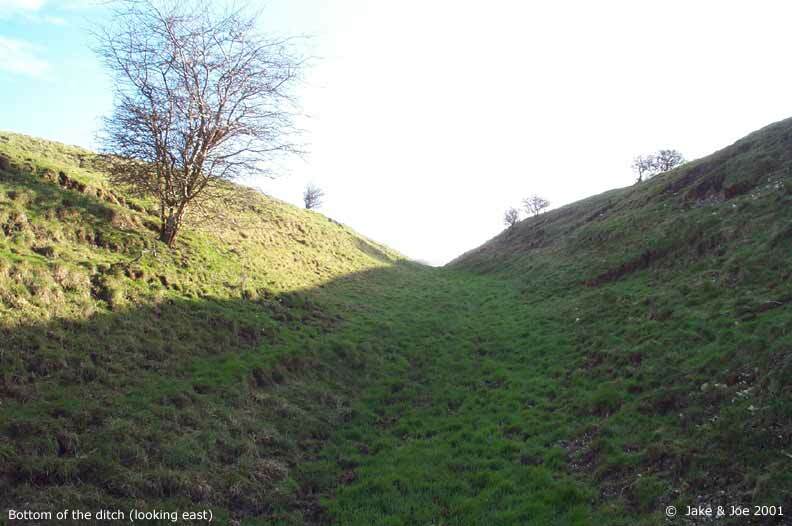 Here we encounter more of the aforementioned earlier earthworks, although all on a much minor scale when compared to Wansdyke. Wansdyke rolls right over these, submerging them as it were, leaving just a small hump. Directions to Section 8 can be found here. Several images by kind permision of David Craig, Jake Livingstone and Joe Boyles.